Road trips are the most amazing part of the journey right from the commencement to the final destination as it includes music at high bass, snacks, gas stations, amazing views, sharing stories, etc. Although most obvious path between two points is a straight line, some roads aren’t commonly constructed as the road to the destination isn’t always straight and easy. Therefore, they are very uniquely and crucially designed and paved so as to make our road trips splendid and our journey to the destination possible, thanks to the engineers!! Here are the world’s most unique roads ever constructed in order to keep the traffic going!!! The North Yungas road stretches from La Paz to Coroico. It is 56 kilometres northeast of La Paz in the Yungas region of Bolivia. It is also referred to as the Road of Death, Grove’s Road and Road of Fate. It is one of the few routes that connect Yungas to the capital city of Bolivia- La Paz. It is a largely single-lane road which has cliffs of about 600 metres on one side. Its width is only about the width of a single vehicle i.e. about 3.2 metres. The visibility hampering factors include fog, rain and water runoff makes the roads muddy during the rainy season from November to March. It was named “world’s most dangerous road” by Inter-American Development Bank in 1995. The local rule specifies that the driver of the vehicle coming downhill must drive on the outer edge of the road so as to have a better view of their outer wheels. The Baldwin Street of Dunedin, New Zealand holds the record for the steepest residential street of the world in the Guinness World Records. This residential suburb is 2.2 miles northeast of Dunedin’s central business district. The street covers a total distance of 350m (1,150 feet). It rises up from 38m (98 feet) above sea level at the junction with North Road which becomes 100m (330 feet) at the top getting average slope of about 1:5. At its maximum, about 70m from the top, the slope becomes 1:2.86(19°). This cul-de-sac is named after William Baldwin, an Otago Provincial Councillor and newspaper founder, who subdivided the area. This 8.274km road connects the island of AverØy with the mainland and the RomsdalshalvØya peninsula. 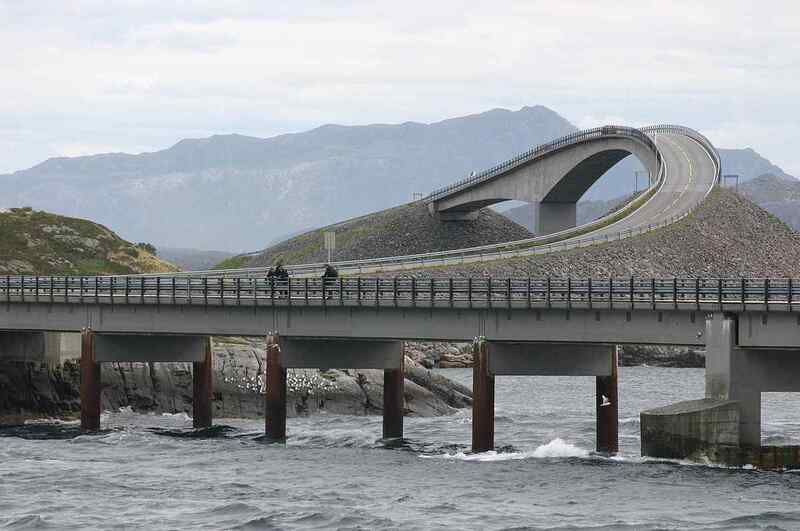 The whole road is built on several islands and skerries, which are connecting several causeways, viaducts, and several bridges including the Storseisundet Bridge as the most prominent one. It runs across an archipelago of partially inhabited islands and skerries. During the construction of this project, the workers encountered 12 hurricanes. The total cost of its construction was Norwegian krono or 122 million. In 2009, the road was Norway’s ninth-most natural tourist visited attraction. In 2006, The Guardian declared it the world’s best road trip. Many advertisers shoot their advertisements in this way. One of the unique roads in the world is a street with one block and eight hairpin turns in San Francisco, California. It is a famous tourist attraction, encountering about 2 million visitors in one year and up to 17,000 on busy summer weekends. It stretches from The Presidio east to The Embarcadero with a gap on The Telegraph Hill. It is named after the Lombard Street of Philadelphia by surveyor Jasper O’Farrell. The Lombard street is one-way block street on the Russian Hill which stands in between Hyde and Leavenworth street. The street is considered to be the most crooked street in the world due to its eight hairpin turns. The sign at the top of the hill recommends keeping the speed of 5mph(8km/h). The block normally sees vehicles up to 250 per hour. During peak times, the vehicles have to wait 20 minutes to enter the street to reach Van Ness Avenue. One of the unique roads in the world located in the Taihang Mountains of China, this tunnel is a carved tunnel from one side and through the mountain. The Guoliang village is located on the top of the mountain. This tunnel links this village to the outside through the Taihang mountains. Cut off from the rest of the world, the village was doomed to become a ghost town, unless a road was made to connect it from the rest of the world. The construction of the tunnel got completed on 1 May 1977. Since then, the village has become a tourist attraction and the area has also been used to shoot a film location. The rough, narrow, and steep road are very dangerous in wet conditions. It is 1,660-kilometre highway connecting Western Australia with South Australia via the Nullarbor Plain. It was named after the person Edward John Eyre who was the first European to cross the Nullarbor by land. It is a part of the National Highway route between Perth and Adelaide and also forms part of Australia’s Highway 1. The major part of the highway is a two-lane single carriageway road with a speed limit of 110 kilometres per hour, except in some built-up areas. The Eyre highway was assessed to be the lowest risk highway by the Australia Automobile Association as the number of crashes was less compared to others per year. It is a mountain pass in northern Italy bordering Switzerland. It is at an elevation of 2,752m above sea level. It is located between Stilfs in South Tyrol and Bormio in the province of Sondrio. It is 75 kilometres from Bolzano and a mere 200 metres from Switzerland border. It is the highest paved mountain pass in the Eastern Alps and the second highest in the Alps, 13 meters below France’s Col de I’lseran. The Stelvio pass glacier usually permits year-round skiing, but it was closed for the first time in 90 years in 2017 due to a heatwave. It is one of the unique roads in the world. It is 259.1 kilometres of the network in service in Japan, serving the major cities like Osaka, Kobe, and Kyoto. It is manoeuvred by the Hanshin Expressway Company Limited. The Hanshin expressway passes right through the 4th, 5th, and the 6th floors of the Gate Tower Building in Osaka. This is the most unique and strangest thing about this expressway as it passes through the three floors of a commute building. The part of the road which passes from inside the building is totally soundproofed. Actually, the pass doesn’t touch the building at all, rather its foundation is on pillars. Therefore, the commuters do not get disturbed by the traffic noise. This road surrounds the Capulin Volcano in New Mexico, USA. It spirals around the extinct cinder cone volcano and visitors can drive up to the parking lot constructed at the rim of the volcano. The volcano last erupted between 58,000 to 62,000 years ago. The volcano road is 3 miles north of the junction of NM Highway 325 and US Highway 64/87. The Nordschleife is a north loop track in Nürburgring- a racing complex, built around the village and medieval castle of Nurburg in the Eifel mountains. It is 20.8 kilometres long and has an elevation of about more than 300 metres. Jackie Stewart, a former British F1 racer known as “the flying Scot” nicknamed this track as “Green Hell”. The track is used as a public toll road during weekdays, except during the races, harsh weather conditions and maintenance. These are the most unique roads in the world. Do post your comments.